At home, we like okra/lady's fingers and make dishes using them quite often. They have numerous health benefits too. In India, you will find okra or lady's fingers as they are more commonly called, used in different cuisines. Elsewhere. in this blog, you will find recipes for a popular Punjabi dish called Bharwan Bhindi; for Bhenda Sagle from Konkani cuisine; and for Bhindi Shengdana from Maharashtra. 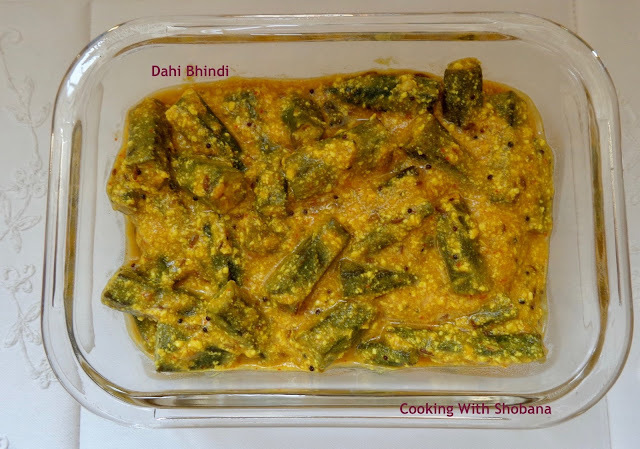 Today's recipe gets it's name from two important ingredients "Bhindi" the Hindi word for lady's fingers/okra and "Dahi" the Hindi word for curds. This has been adapted from Dahi Bhindi in Manjula's Kitchen. Wash and pat dry the lady's fingers. Snip off both the ends, cut the lady's fingers into 1" pieces. Transfer the lady's fingers to a bowl and keep aside. Cook for 2-3 minutes till the oil leaves the sides of the pan. Transfer to serving bowl and serve with jeera rice or rotis, parathas.